I recently found an old friend of mine on Linkedin, and was happy to see where his career has led him in the 15 years since we last saw each other. His lighting is always spot on...pun intended. 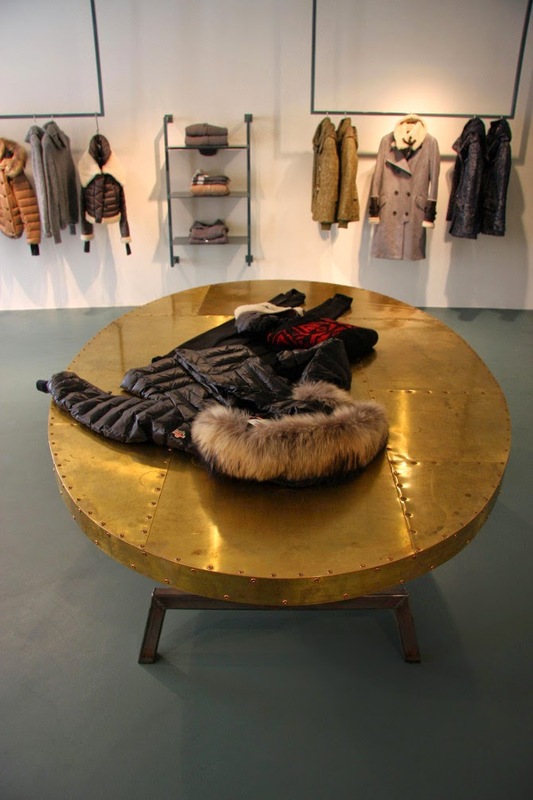 Gorgeous studded sheet brass display table. 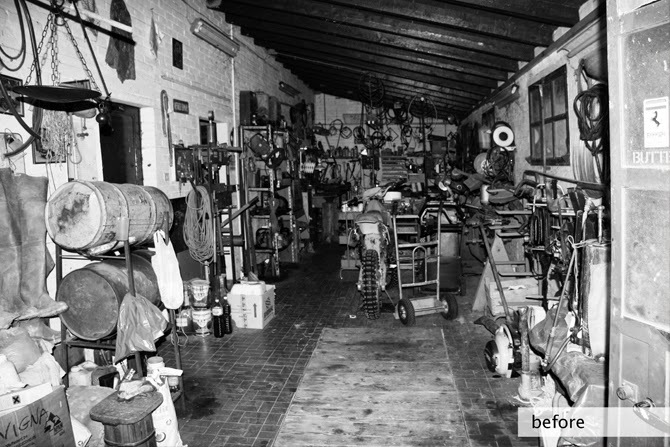 I also love the racks hanging from the ceiling. 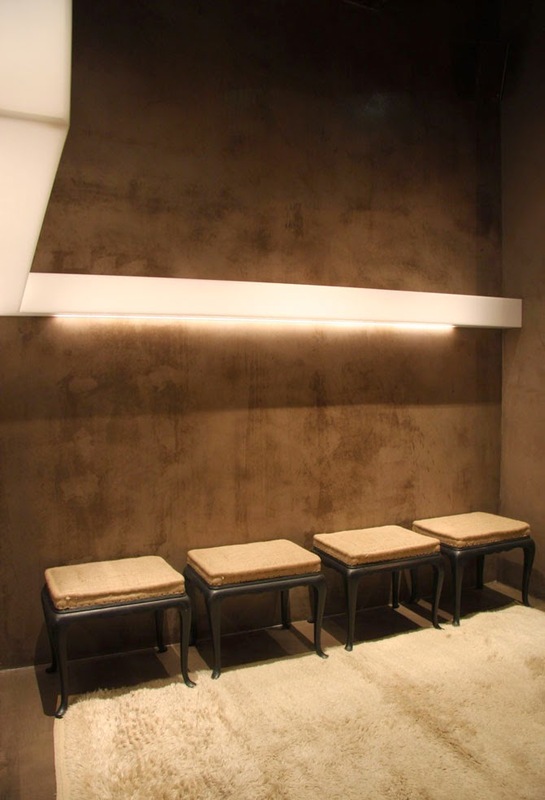 Minimalist lighting, mini French mattresses, cerused concrete and fur... blending hard and soft. 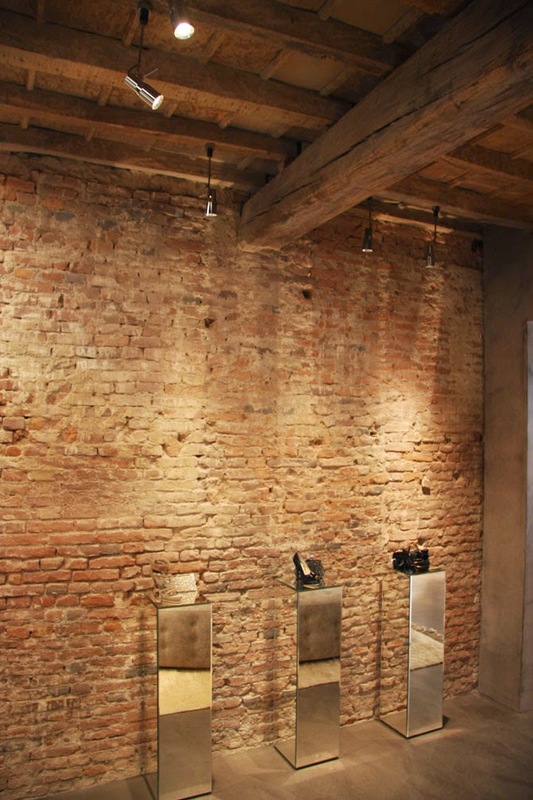 In Italy, most stores are in the historical centers of town where the buildings are protected by legal codes to preserve cultural and architectural integrity. 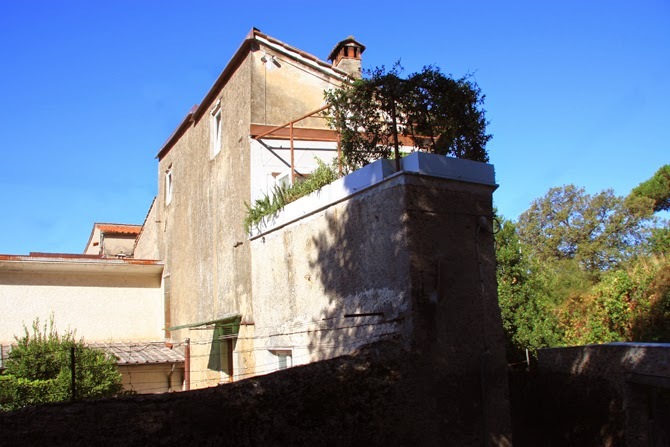 What might be viewed as a hinderance and bureaucratic annoyance by some, is actually what preserves antique architecture. 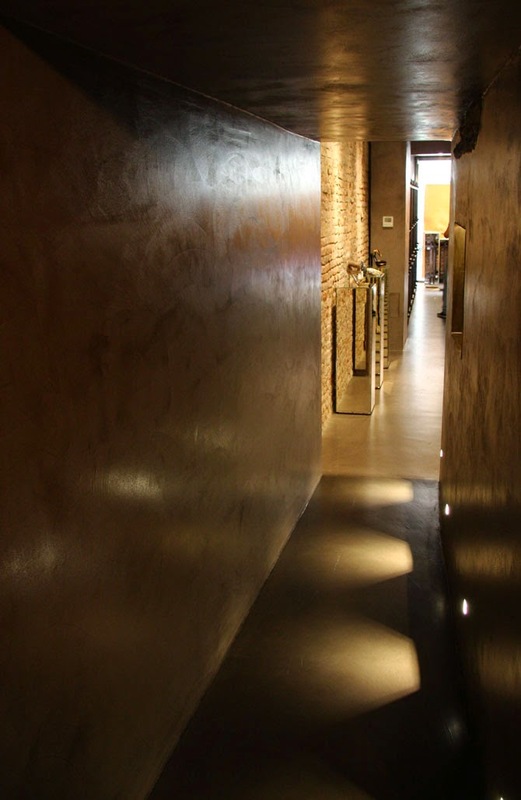 Hence, Italian architects are masters of blending the old with the new, as seen above and below. 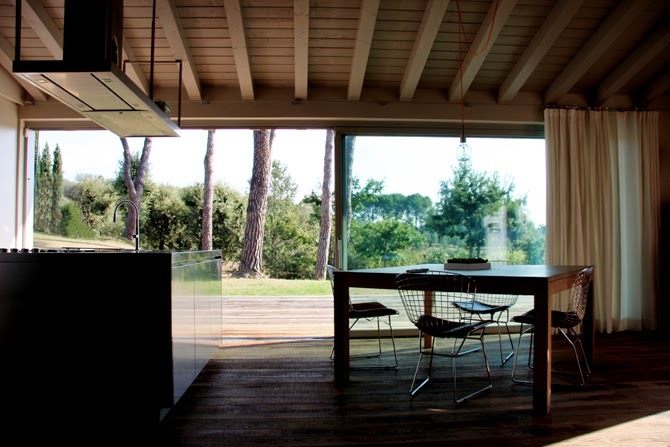 In Italy, an architecture degree also encompasses a degree in design. 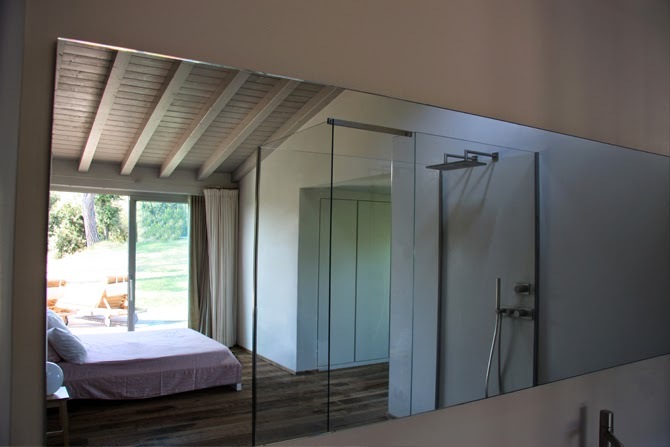 In fact, most homeowners will hire one "architetto" to design not only the architecture, but also the interior. 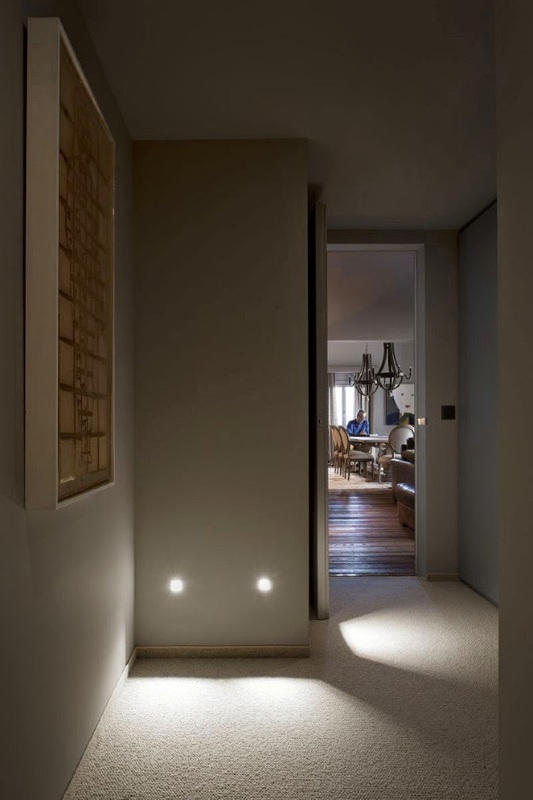 Living in Italy, I sometimes found this to be a mistake, since architects focused so much on the lines of the structure that the interiors often lacked warmth, charm and personality in the furnishings. This is not the case with Paolo's work. 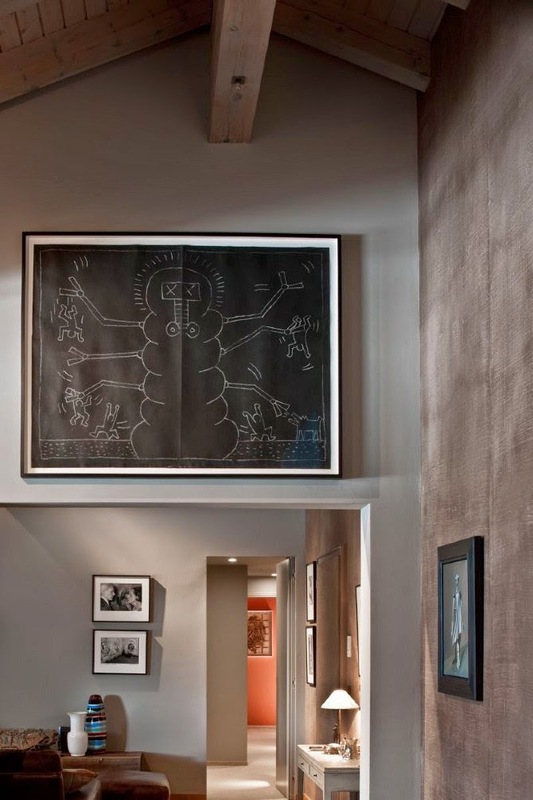 He manages to maintain the integrity of the building by blending historical elements with modern function and style, but he also infuses them with vintage pieces, creative color choices, original art and luxurious custom window treatments: all lending an air of home...CASA. 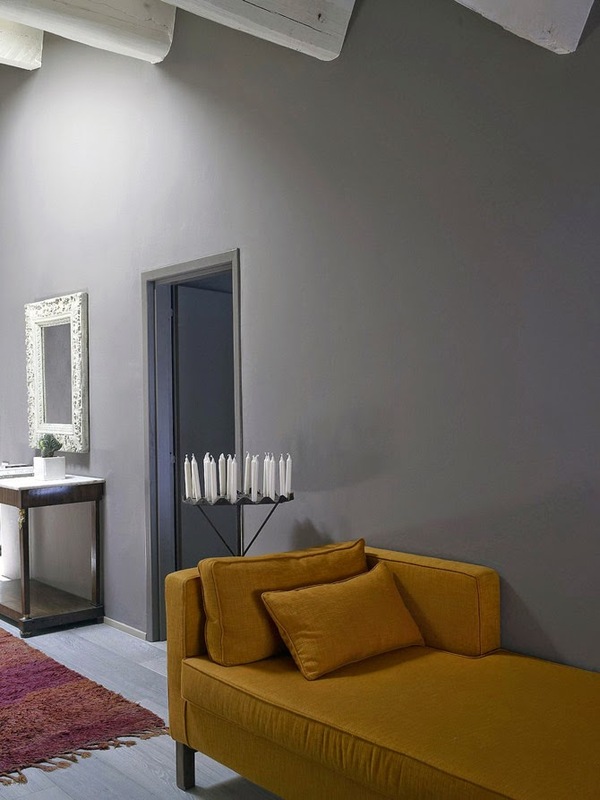 A gorgeous image: here we have it all in a Pietrasanta residence...a perfect fusion of old and new in a luscious mix of dove grey (looks lavender in this light! 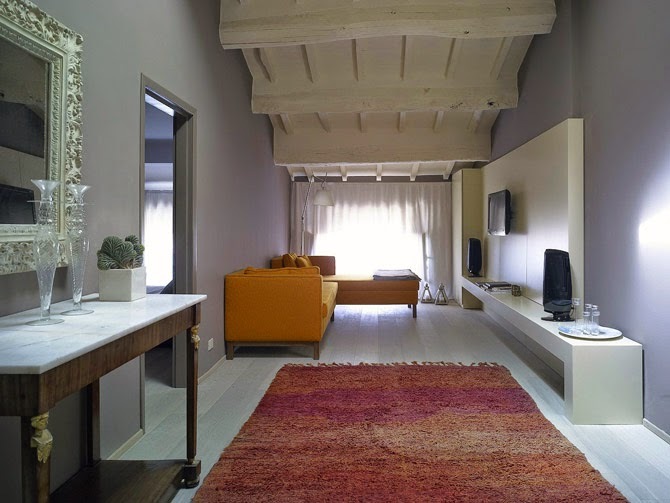 ), marigold and ombre cerise...all grounded by whitewashed floors and ceilings. 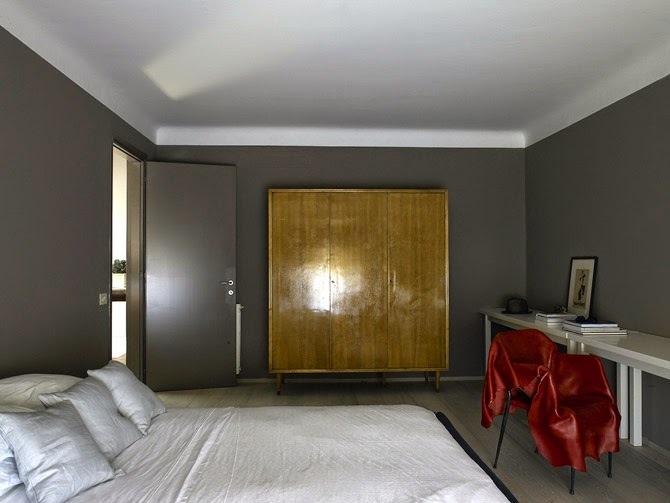 The gold is brought back into the master bedroom in this mid-century armoire. 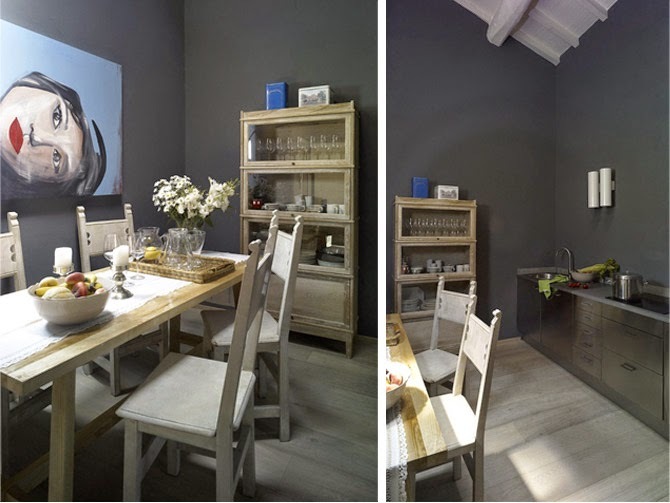 Cool grey and white is rendered warm and homey with the vintage wood cabinet, table and chairs. 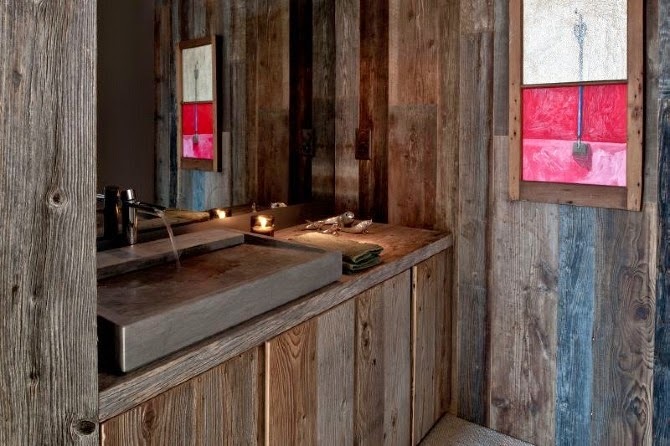 The essentials are kicked up a notch: an asymmetrical vessel sink, great lighting, a travertine vanity, which I am guessing came from a local quarry, and the mirror. J'adore. 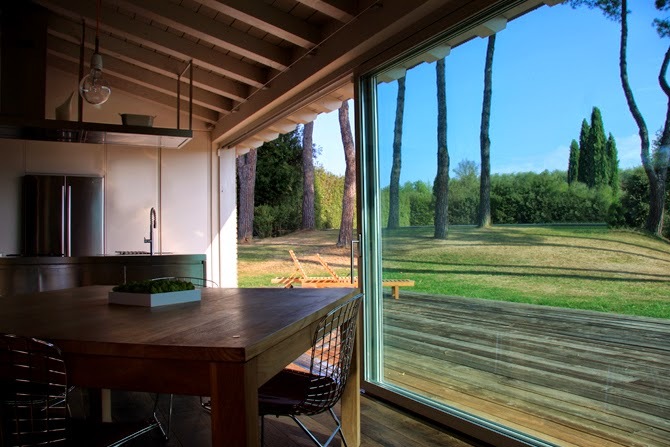 In another Pietrasanta residence, just a stone's throw from the Tuscan coastline, Paolo kept the flow with green and red...a very unexpected color combination outside of Christmas time, but it totally works here. 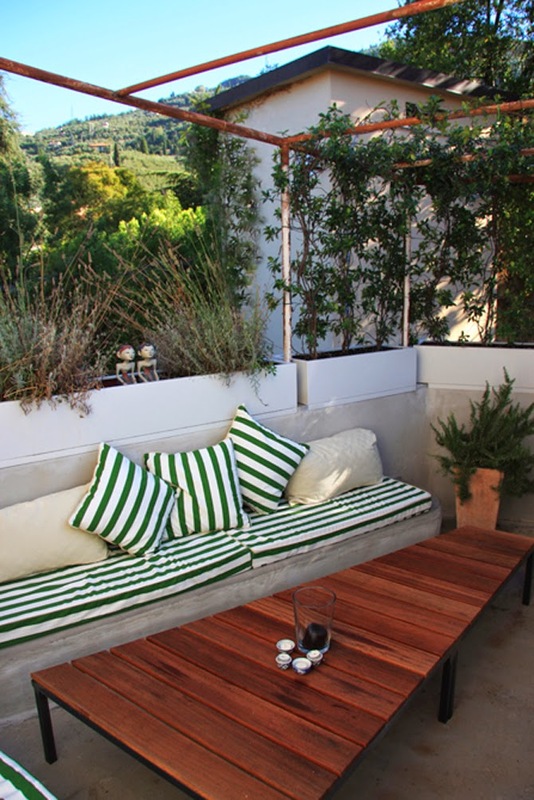 I can almost smell the lavender and jasmine now... betting you can smell the sea from this terrace as well. 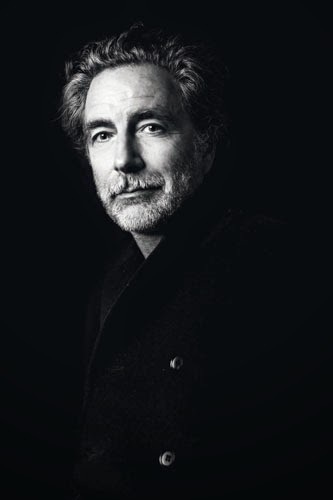 This is my favorite image of all. The new chevron wood floor. 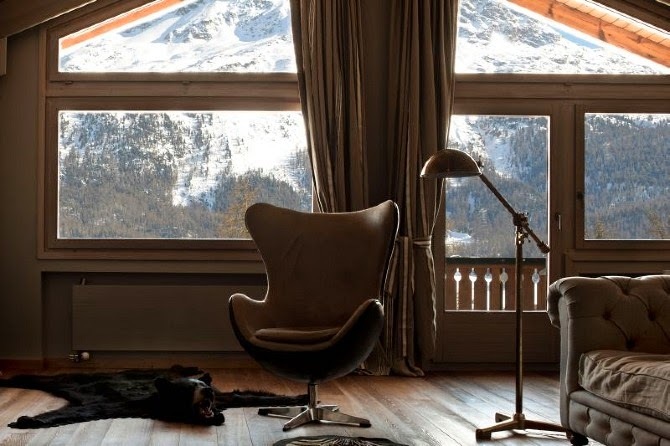 The vintage chair. 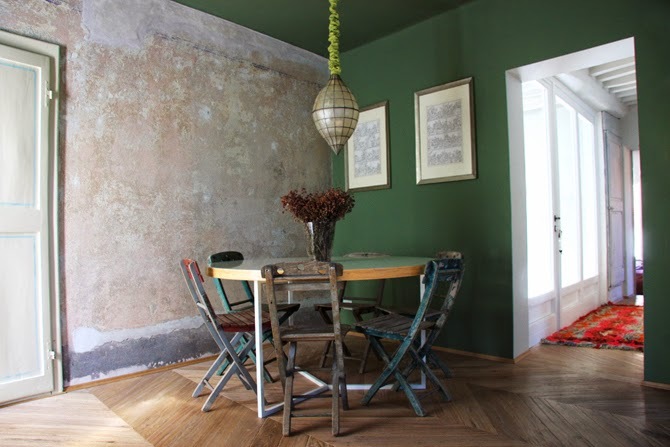 The patina on original plaster walls, left untouched. 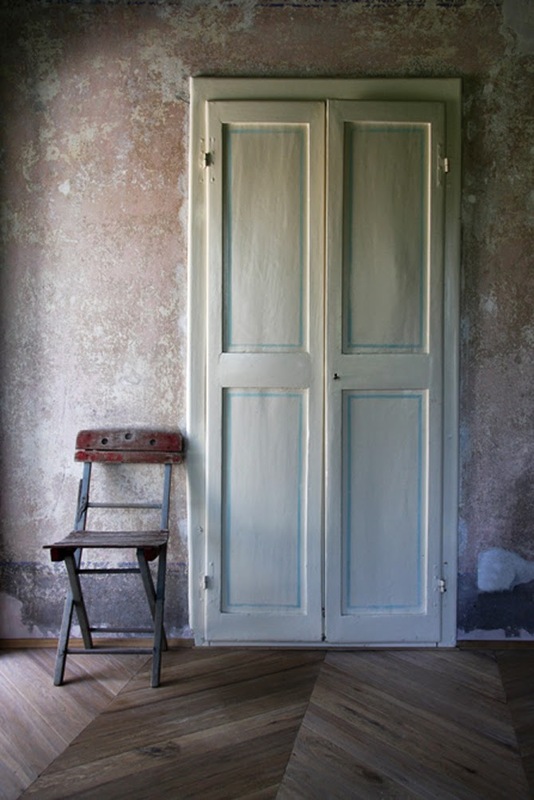 The French door. Bravo. I recently read a quote somewhere in the design world about the benefits of clashing colors, and unfortunately I have a terrible memory, so I cannot recite it. There is so much that is truly awesome about this image, but what strikes me every time I see it is the apple green cord cover against the emerald green walls. Sometimes the tiniest details make the biggest difference. This image would not be the same with black scrunchie, would it? 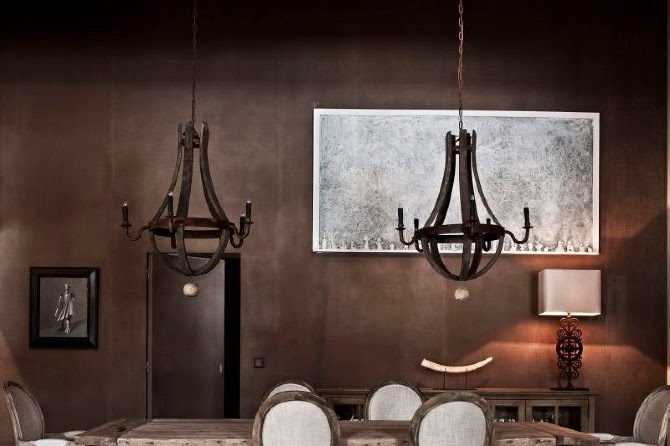 Again, contrasts of antique and modern, dark and light, hard and soft edges, textures. 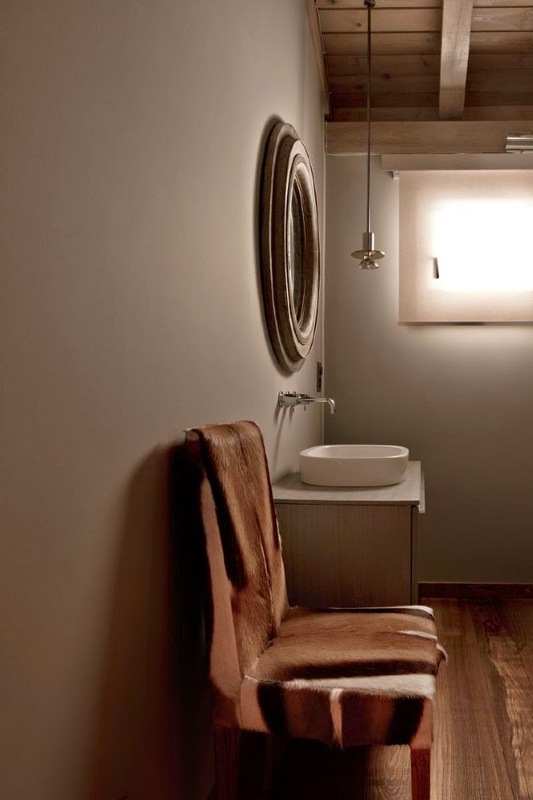 Those vintage chairs look like they came from a beachside cafe' or "bagno". 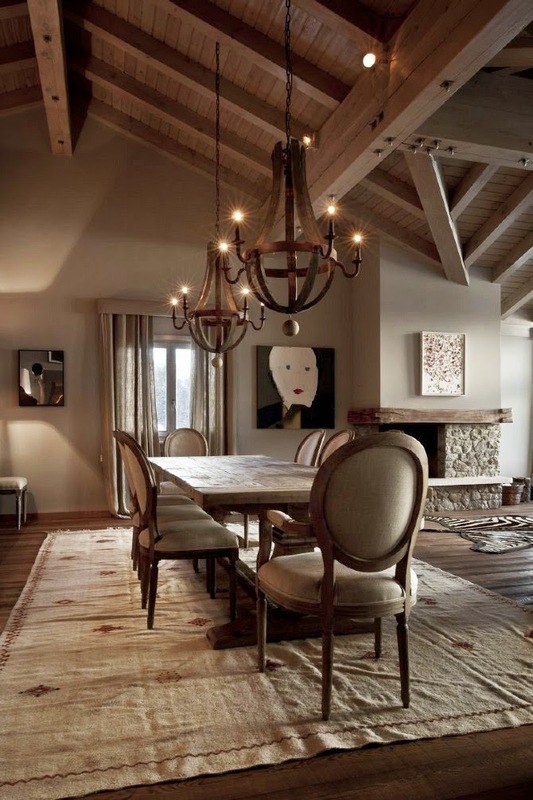 The global elements of the capiz pendant and antique red rug rock. Punto e basta. 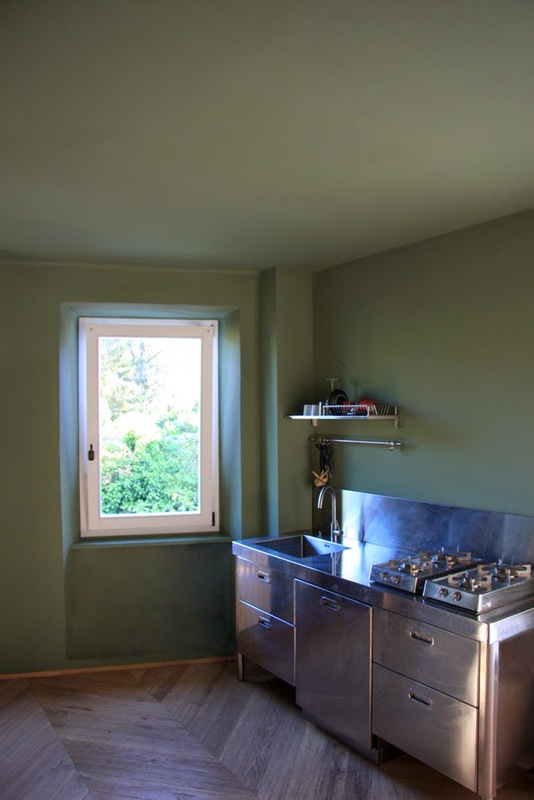 Basic, essential, industrial kitchen...all you need at the beach. I should know the provenance of the rug, but don't. Anyway, it's just. plain. fabulous. 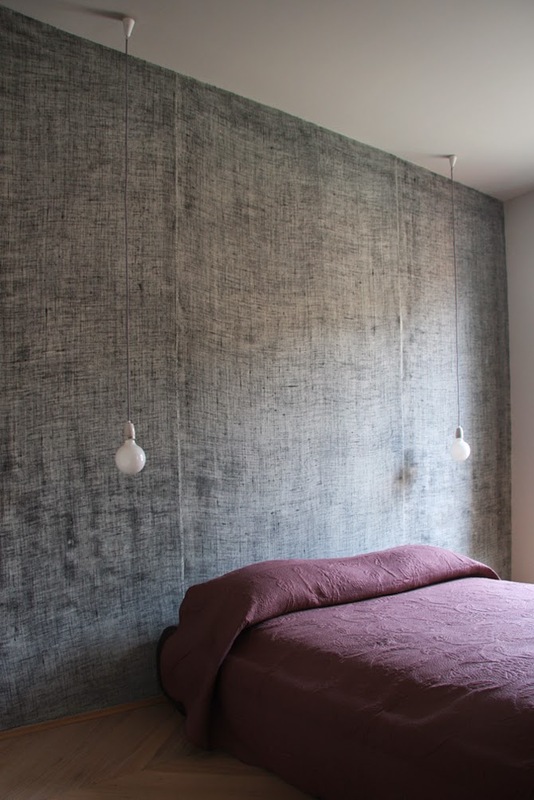 Textured linen walls, a pair of simple pendants, quality bedding. Less is more. 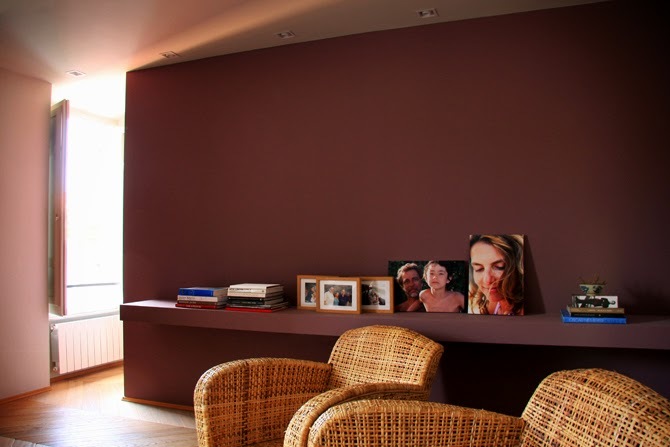 Burgundy wall with gallery shelf for family portraits. Texture. 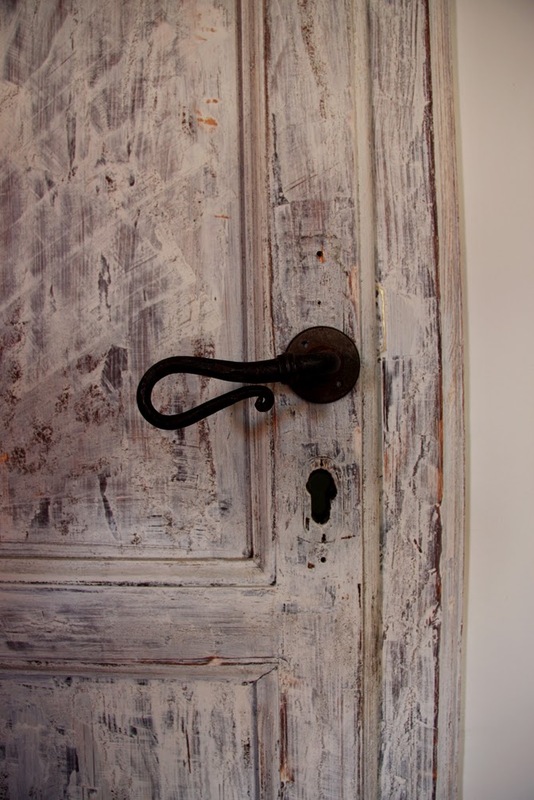 I am a sucker for distressed doors and great hardware. No secret. 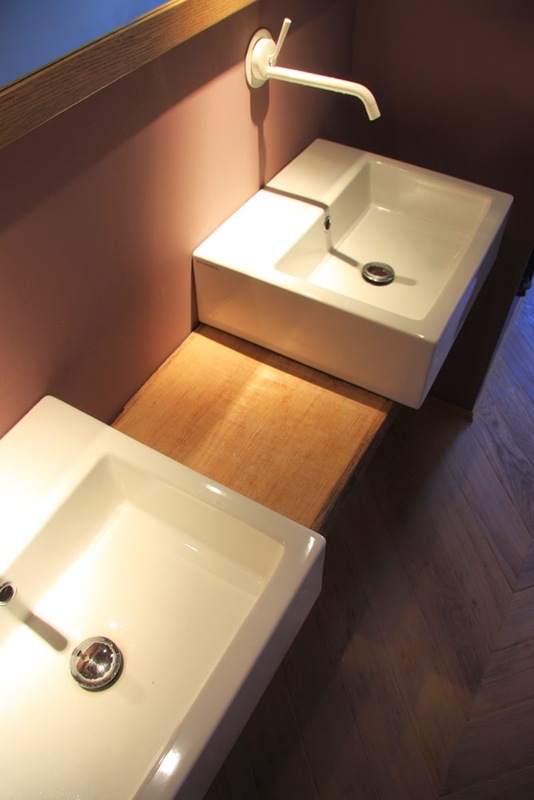 The fact that the sinks overhang the shelf might have sent me into a panic as a designer. This was intentional, I bet. I like it. The exterior is unassuming, and I am guessing that this farmhouse is divided into multiple flats. Who would know that inside lies a little gem? 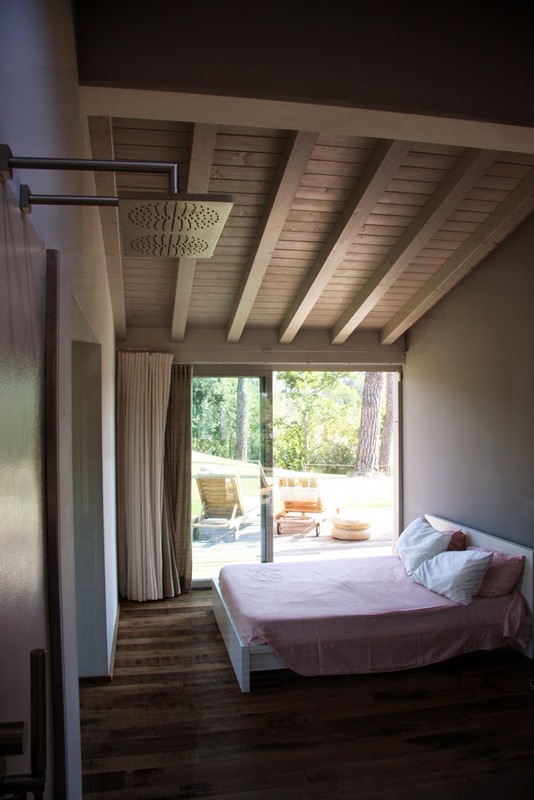 In Radda in Chianti, where Paolo gave me one of my first design jobs almost 20 years ago, old workshops and olive oil "frantoi" have been converted into chic vacation rentals. People come to Chianti from all over the world for it's unparalleled view. 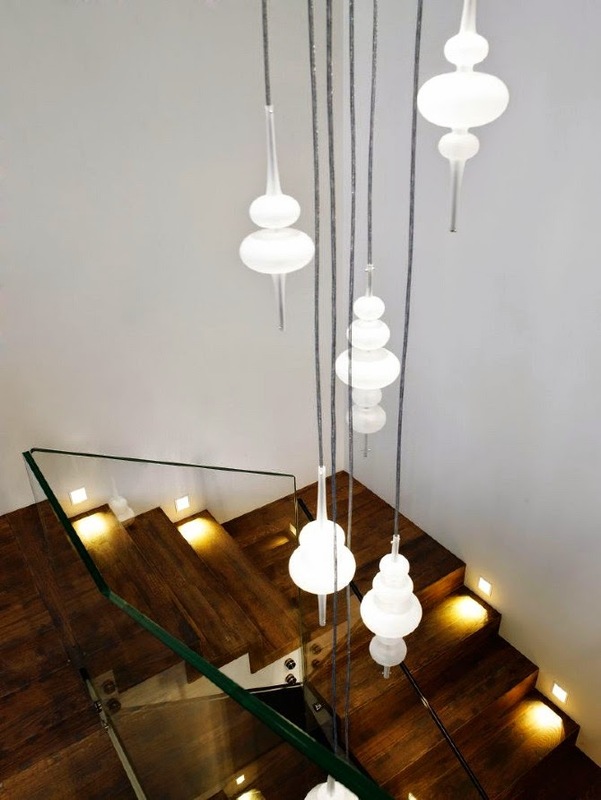 Smart move to create this glass wall of sliders. 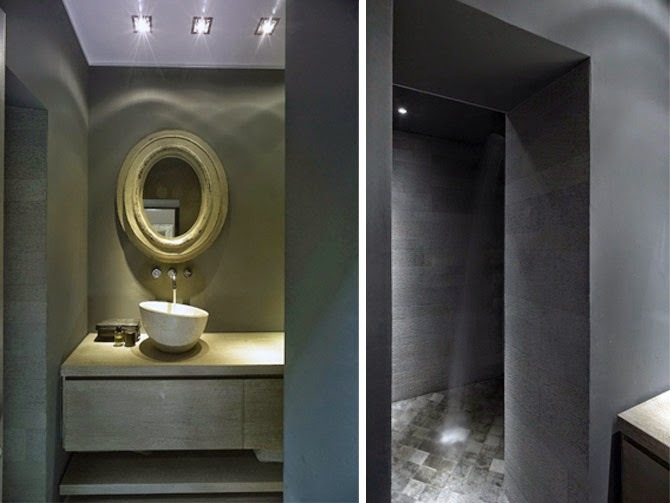 Love the shower heads. And the drapes. Old and new. Cute pic. 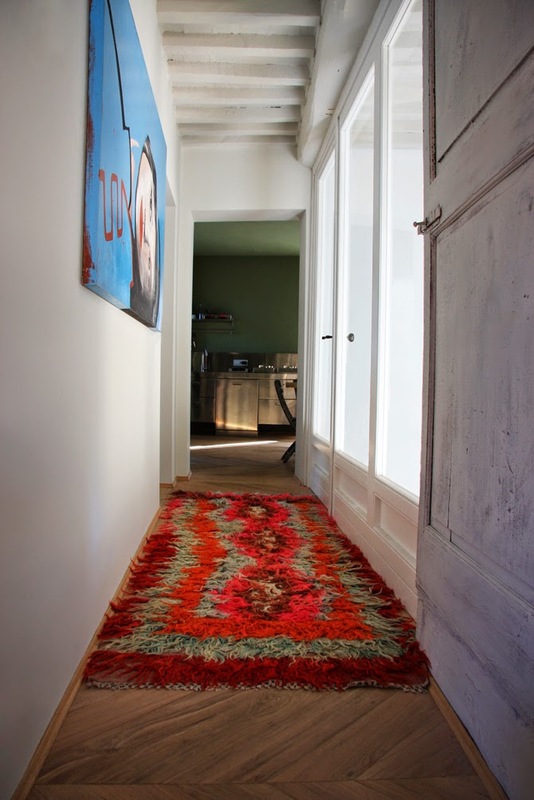 Awesome rug. 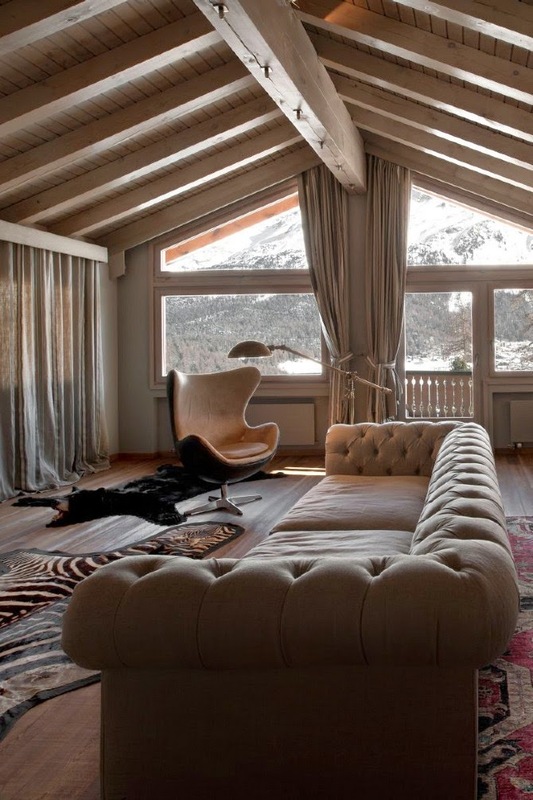 Paolo designed this mountain residence in the exclusive ski resort of St. Moritz. 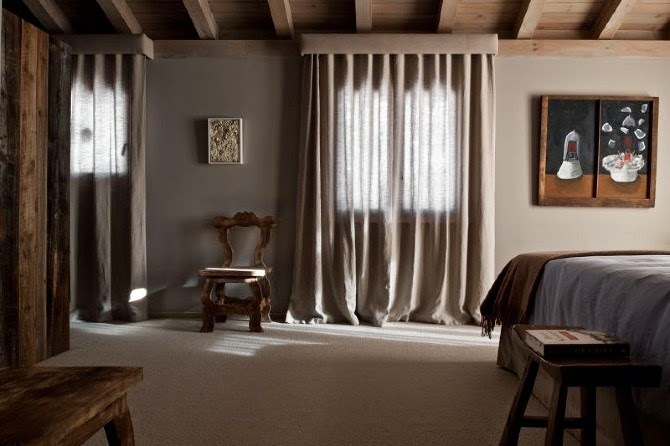 Bleached woods, voluminous linen draperies, neutral furnishings...all with a very Restoration Hardware vibe... create the perfect ambiance for a luxurious, yet laid back ski retreat. 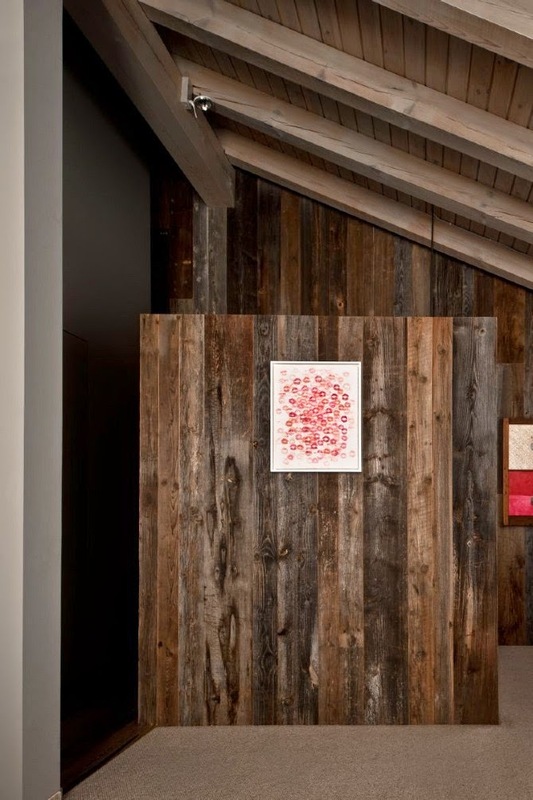 Personal touches in the art and rugs as well as barn wood clad walls in the bathroom add texture and uniqueness. Enjoy. For more info on Paolo, please visit his website, and take a look at the attached video called "Joining Giachi", where he documents his life and work. Grazie Paolo, per avermi consentito questa presentazione.